A legal challenge questioning the constitutionality of a federal law authorizing warrantless electronic surveillance of Americans inched a step closer Wednesday toward resolution. The 2nd U.S. Circuit Court of Appeals for the second time rejected the Obama administration’s contention that it should toss a lawsuit challenging the 2008 Foreign Intelligence Surveillance Amendments Act. Among other things, the government said the plaintiffs — Global Fund for Women, Global Rights, Human Rights Watch, International Criminal Defence Attorneys Association, The Nation magazine, PEN American Center, Service Employees International Union and others — don’t have standing to bring a constitutional challenge because they cannot demonstrate that they were subject to the eavesdropping or suffered hardships because of it. The lawsuit, backed by the American Civil Liberties Union, was lodged within hours of the FISA Amendments Act (.pdf) being signed into law by President George W. Bush in July 2008. The legislation is being challenged because it allows the National Security Agency to electronically eavesdrop on Americans without a probable-cause warrant if one of the parties to the communication resides outside the United States and is suspected of a link to terrorism. “It is the glory of our system that even our elected leaders must defend the legality of their conduct when challenged,” (.pdf) Judge Gerard Lynch wrote for the divided court. In a 6-6 vote, the New York-based appeals court let stand its March decision allowing the case to proceed. A majority vote of the court’s active judges is required to rehear cases. After three years of litigation over whether the plaintiffs had standing, the merits of the case could soon be litigated in a New York federal court. That is, if the Supreme Court does not intervene or the administration does not play its trump card: an assertion of the powerful state secrets privilege that lets the executive branch effectively kill lawsuits by claiming they threaten to expose national security secrets. The courts tend to defer to such claims. But in a rare exception in 2008, a San Francisco federal judge refused to throw out a wiretapping lawsuit against AT&T under the state secrets privilege. The AT&T lawsuit was later killed anyway, because the same FISA Amendments Act also granted the phone companies retroactive legal immunity for their alleged participation in warrantless wiretapping of Americans’ internet communications. The Electronic Frontier Foundation claims the spying is ongoing and telecoms are siphoning all electronic communications to the National Security Agency without warrants. An EFF lawsuit challenging the immunity is on appeal at the San Francisco-based 9th U.S. Circuit Court of Appeals. 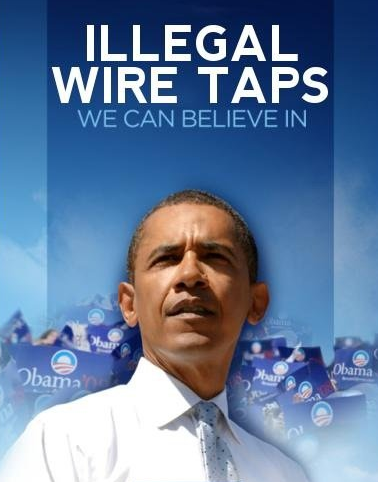 The FISA Amendments Act — which passed with the support of then-senator Barack Obama — generally requires the Foreign Intelligence Surveillance Act Court to rubber-stamp terror-related electronic surveillance requests. The government does not have to identify the target or facility to be monitored. It can begin surveillance a week before making the request, and the surveillance can continue during the appeals process, in the rare instance of rejection by the secret FISA court. The FISA Act, first enacted in 1978 in the wake of disclosures about abuses of intelligence powers to spy on Americans, previously required targeted warrants for any spying directed at American citizens. The plaintiffs in the 2nd Circuit case claim the legislation chills their speech, and violates their Fourth Amendment privacy rights. In a bid to win standing, they argued that they often work with overseas dissidents who might be targets of the National Security Agency program. So instead of speaking with those people on the phone or through e-mails, the groups asserted that they have had to make expensive overseas trips in a bid to maintain attorney-client confidentiality.